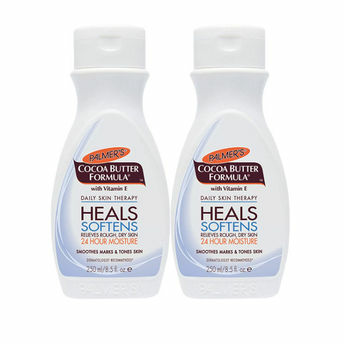 Tone your skin with Palmer's Cocoa Butter Formula Moisturizing Lotion. Enriched with the goodness of cocoa butter, which is a natural moisturiser. Made with pure Cocoa Butter, Vitamin E and other rich emollients, it provides just the right amount of moisture leaving your skin soft and smooth. Additional Information: Palmers is more than 170 years old, founded in 1840 and since then it has been famous in the families for generations. All the products are natural and paraben free.